The palatial stairs in Piazza di Spagna are one of the main cultural centers in the heart of the Eternal City. Former home to poets John Keats and Percy Shelley, the main attribute of this area is elegance. During the holidays, a towering Christmas tree lights up the whole square. No wonder why haute couture brands such as Gucci, Bulgari and Valentino picked it as main location for their flagship stores. One of the most exclusive things to do while in Rome is to start from Piazza di Spagna and then take a walk through Via Condotti, Rome’s main luxury shopping street. Whether you are looking for the perfect Christmas gift or just admiring all the gorgeous window displays, make sure to stop at Fendi, famous for its ever changing Christmas lights. High-end shopping is definitely a staple for Christmas in Rome. 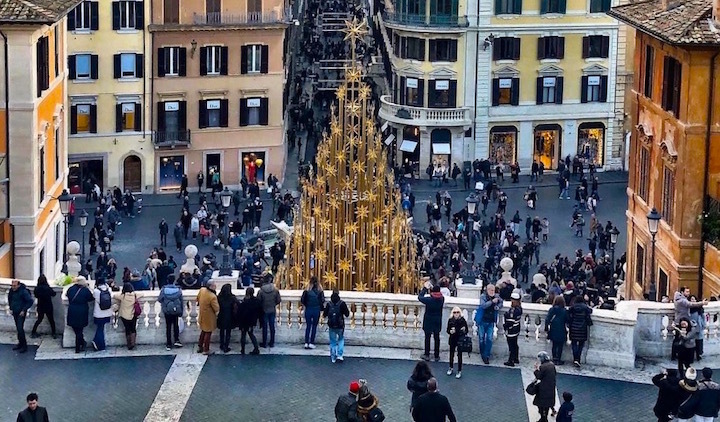 Via del Corso is an unmissable stop if you want to soak all the Roman festive spirit in. Right at the intersection with Via Condotti, this wide street completely transforms during Christmas and shimmers with golden lights. It is famous for its more accessible stores and boutiques and for the many stands that serve roasted chestnuts in paper cones. While nibbling on a warm chestnut, you can stop to hear one of the many talented buskers. Then, walk north and reach Altare della Patria and the Roman Forum, or head south and reach Piazza del Popolo. 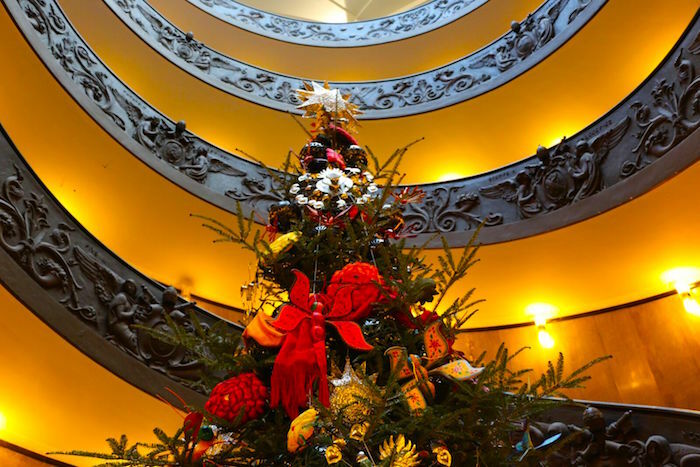 The Vatican is the heart of Christmas in Rome and exhibits one of the most magnificent displays in the world of the Christmas tree. You can also marvel at an exceptional life-size nativity scene, usually unveiled on Christmas Eve. On that day, you can head to the Square at midnight and follow the mass from the huge TV screens while the Pope is inside of the the Basilica. Alternatively, you can attend his yearly Christmas message at noon on Christmas Day. Another great day to hang around St. Peter’s Square during the holidays is December 13, St. Lucia’s Day. Then, you can enjoy a colorful and festive parade in the Square! During the holidays, the whole area surrounding Castel St. Angelo is lit up and draped in Christmas lights. Walking on the St. Angelo bridge with magnificent statues at your sides and a festive atmosphere will be an unforgettable and unique experience. Go for a spin on the renowned ice skating rink. Who wouldn’t want to ice skate while looking at one of the most important landmarks in Ancient Rome? 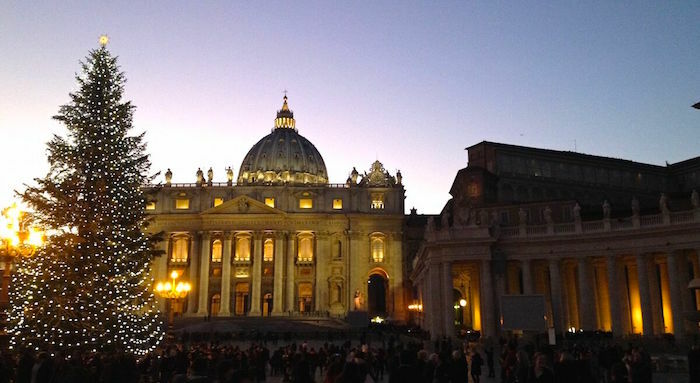 Rome is notorious for its many churches and religious symbols. While you’re in ROme during the holidays, you can attend one of the many concerts available during the season. From parish choirs to gospel concerts and church organ plays, the breathtakingly austere setting will make this a one of a kind experience to have in Rome. Some of the main locations for Christmas concerts throughout the Holidays are Basilica di San Paolo, Chiesa di Sant’Ignazio, Capuchinis Crypt and Palazzo Doria Pamphilj. To find all locations and timetables according to your travel dates and needs, visit the websites Roma Opera Omnia and Classictic. Italians are most famous for their delicious cuisine. During Christmas in Rome, temperatures can be quite low and Marzapane is the perfect hideaway from the city center, with only 20 exclusive seats and immersive culinary itineraries. Their burrata-topped shrimp tartare served with a pistachio biscuit is not to be missed. Try their duck with endive and oranges too, only available in small portions. For a real taste of fresh Roman winter produce, make sure you don’t leave the city before trying a traditional Roman artichoke, seasoned and fried to perfection. Wine is one of the biggest attractions of Italy and Rome makes no exception. Cold winter evenings are the right time to venture into one of the many Enotecas, typical wine houses, and enjoy a couple glasses (or more) of the most prestigious regional wines and culinary gems. For an upscale wine tasting experience, head to Enoteca Cavour, in the heart of the Roman neighborhood of Monti. Established in 1933, this exclusive winery has a selection of over 1000 bottles, also available for purchase.